← Sir Walter Raleigh’s Lost Fort Found? First I’d like to congratulate Brent Lane with the First Colony Foundation for his keen eye in spotting the anomaly on John White’s map drawn of “Virginia” in 1585-1586 and the British Museum for their fine detective work. 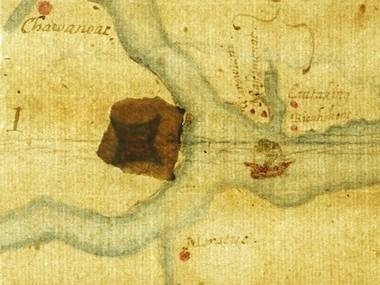 The Museum analyzed the map, shown below, and discovered the hidden icon locating a fort at the confluence of the Roanoke and Chowan Rivers under a patch. This new piece of information is both important and enlightening….and like many news items, has been blown a bit out of proportion. It has been reported that this is the location where the lost colonists relocated, which at this point, is certainly a leap of logic. Let’s take a look at what was found, what we know, and the possibilities of what it might mean. John White was an artist. 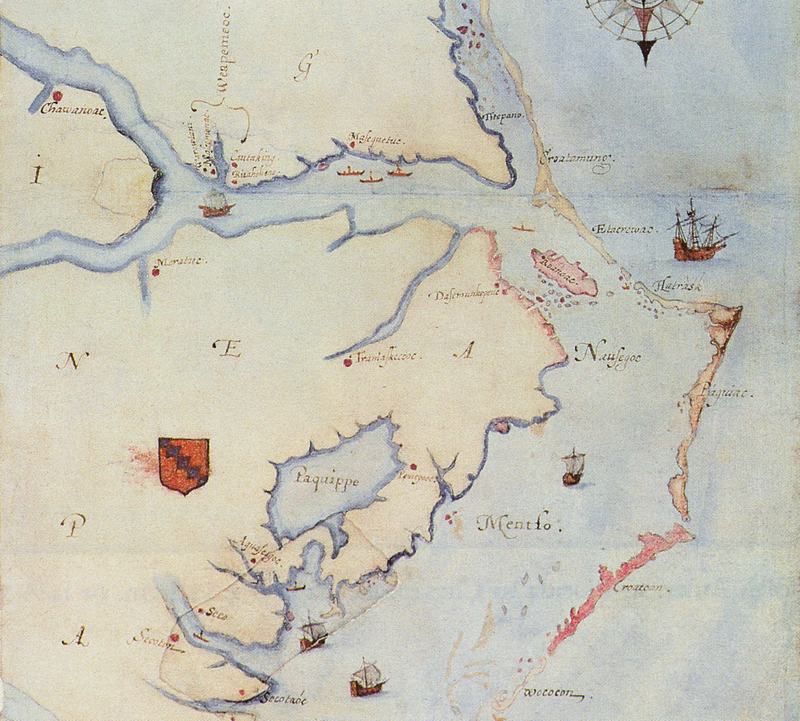 He accompanied the 1584 and 1585/1586 military expeditions to what was then called “Virginia.” Those expeditions, headquartered off of Roanoke Island, were specifically to scout a suitable location for establishing a colony, the “Citie of Raleigh.” The location chosen was in the Chesapeake region, not Roanoke Island, but a snafu in 1587 resulted in the colonists being literally abandoned in August on Roanoke Island where the following supply ships would never find them. They sent John White, then the governor of the “Citie of Raleigh” back to England for supplies which they expected to arrive in the spring of 1588. The above map is John White’s map drawn during the 1585-1586 military voyage of discovery. The military men spent quite a bit of time exploring the region, meeting the natives, learning about the region and potential locations for a permanent colony. John White, in 1587 was only on Roanoke Island for a few days before departing again for England, so we know this map was not drawn on that trip. Prevented from returning to Roanoke in 1588 and 1589 by England’s war with Spain, when he was able to return in 1590, he found the colony removed and the message “CRO” and “Croatoan” carved on both a tree and fort post for him. If they relocated to the Chowan River location, why would they have carved Croatoan and CRO at the fort? Before White left, the colonists has discussed moving “50 miles into the main.” White told us this, but he never revealed the location. John White could not have drawn this map in 1590, as he was only on Roanoke Island and only for a day or so before a hurricane blew the ship back to England. Therefore, John White’s original map had to have been drawn no later than 1586. However, John could have modified this map anytime between then and his death in 1593. Someone else could have modified the map, then or later. But, assuming the modifications were made by White, why would John White cover this location? And what does this fort location mean? I’ve read in several news sources in the past few days that this is the final destination of the colonists and indeed, where they went. While this is certainly one of the possibilities, there are also others, and I’d like to briefly touch upon the various possibilities and the logic for each. 1. Military Fort – It’s certainly possible that at one time the military colonists of 1585/1586 were planning to built a fort further inland. If so, this initially looks like a great location, at the juncture of two rivers and fairly easy to defend. However, there is no indication a fort was ever built there….and the resulting “coverup” patch on the map may indeed only reflect that change of plans and the lack of an eraser. John White worked in paint, and there was no “White Out” or erasure for that. His only choice if a planned location did not develop would have been to put a patch over the location. A second patch on this map indeed is only to show changes to the coastline on the map. When White left, the relations with the Indians were deteriorating rapidly. The English had just beheaded Wingina and killed many of his villagers. John White never knew where the colonists actually went, although he believed, based on what he found, that they went to Croatoan and were safe. He had arranged with the colonists before he left for a secret token, a cross, to be carved if they were in danger or under duress when they left Croatoan Island. No crosses were found. But a clear location, carved twice, was found. If this fort was the “50 miles into the maine” location, why might John White cover it up? There are really only two options. 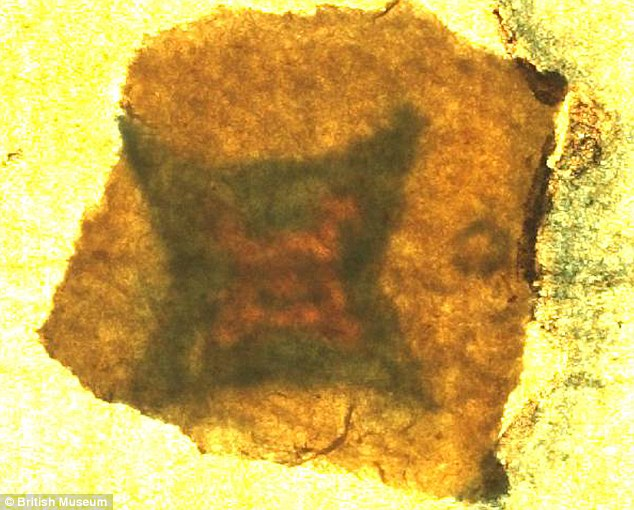 First is that it was no longer valid, meaning that further discussions or investigation caused them to change their mind about that location. However, it’s worth noting that no other location is marked and that this region does fit the “50 miles” criteria fairly accurately. The second possibility is to hide the location, probably from the Spanish. Espionage was common in England at this time and the Spanish were actively seeking the colony in order to destroy them. 3. The only thing shown on the map is a fort symbol. We don’t know if this was originally meant to be a military outpost, the new “Citie of Raleigh” or something else. We cannot assume that this fort was ever built. In fact, there are no oral histories, or local histories or even rumors of a fort in this location. It would be difficult to built a fort of the size required to house 117 people without some remnant remaining and being recorded in some type of record. By 1654, explorers from the Jamestown region were active in this same area and no fort or remnant of a fort was ever reported, less than 65 years later. It should be noted that the Tuscarora have an oral tradition of being descended from the Colonists. The Hatteras Indians are recorded by Lawson in 1701 as both having an oral tradition along with grey eyes and lighter hair, unlike any other Indians. 4. In terms of relations with the Indians, the military expedition of 1585-1586 was a disaster as what is known of the 1587 settlement before White departed for England. The 1585/1586 military colonists burned the village of Aquascogoc, destroying the corn crop, and therefore the food of the people for the upcoming winter. These actions were the precipitating factor in the murder of George Howe, one of the 1587 colonists upon their arrival. In retaliation for Howe’s death, 1587 colonists beheaded Wingina, the chief, and massacred the people in his village across the bay from Roanoke island where they had resettled after leaving Roanoke Island where the English fort was located. Given these aggressions, would it be logical for the colonists to move to a location where they are surrounded by three tribes of Indians, at least one of them known to be hostile and a second likely to be? Taken from Andy Powell’s book, “Grenville and the Lost Colony of Roanoke,” the following is excerpted from the transcript of the original Barlowe journal from 1585-1586 which was included in the Hakluyt records compiled in 1589. Several men, with Manteo, rowed upstream in the Roanoke River to the Chowan and up the Chowan for some distance, a total of about 140 miles hoping to find gold or the location of where gold could be found. The newly discovered fort icon on the map is at the confluence of those two Rivers. Here’s what Barlowe had to say about that exploratory trip upriver. The fabled mines of Chaunis Temoatan have never been found. The reputation of the English had preceeded them. The Indians on Roanoke island presumed the English would die of starvation. They did not, and returned to the island with Menatonan’s son as hostage. When the English settlers arrive in 1587, hard feelings remained among the various mainland tribes. George Howe was murdered in retaliation for the burning of the village of Aquascogoc. The English then escalated the conflict and massacred the inhabitants of Wingina’s village. This action in 1587 just prior to John White’s departure for England, did nothing to endear the English to the Native people. By this time, they had alienated nearly all of the neighboring Native tribes by either warfare, kidnapping or burning their villages. They were sitting on a tenderbox and the only tribe who would provide them with assistance would be Manteo’s people, the Croatoan. Given this information, I’ve plotted the locations of the events noted above. 2=location of Moratuc [Tuscarora] who fought with Chowanac and fired upon the English. 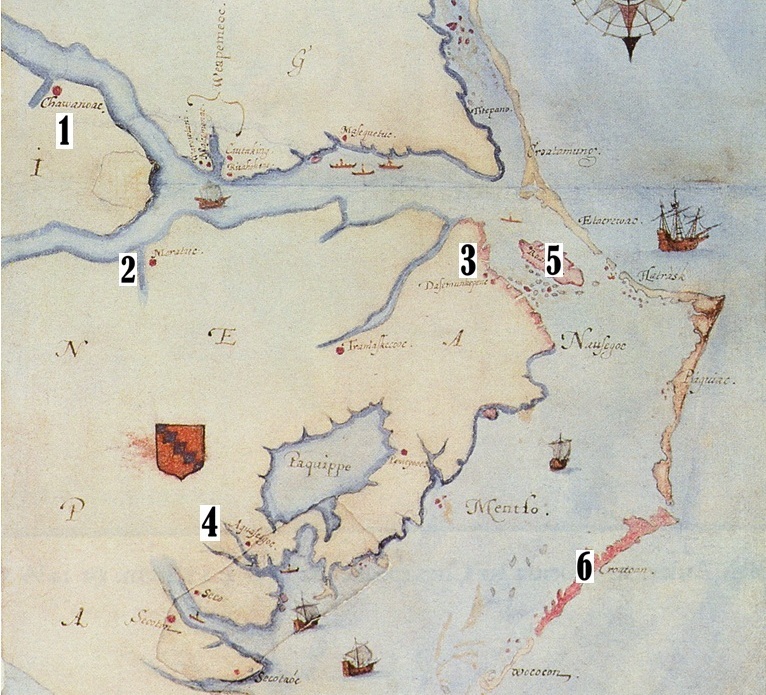 5=Roanoke Island, the site of the 1584 and 1585/86 military forts and where George Howe was murdered by Natives in revenge in 1587. Subsequently, Wingina was murdered across the bay. Given the volatile situation in 1587, would you locate 117 English non-military colonists between locations one and two in a fort, or on Hatteras Island among friendly Indians? The above map images are copyrighted by the Trustees of the British Museum. This entry was posted in Chowan, Hatteras, Tuscarora. Bookmark the permalink.